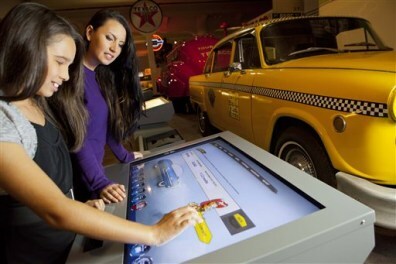 In this Nov. 9, 2011 photo released by The Henry Ford, visitors use a touch screen at The Henry Ford in Dearborn, Mich. The suburban Detroit museum founded by auto pioneer Henry Ford is revamping its automotive displays, offering a fresh look at its rich collection and showcasing the enormous influence of the automobile on culture and daily life in the United States. “Driving America” opens to the public Jan. 29 following a year of construction at the museum.